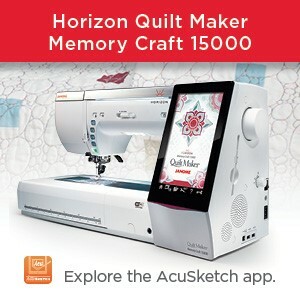 Undoubtedly you’ve seen or heard that Janome recently launched the fabulous Horizon Memory Craft 9450 QCP, an updated version of the incredibly popular Horizon MC 9400 QCP. 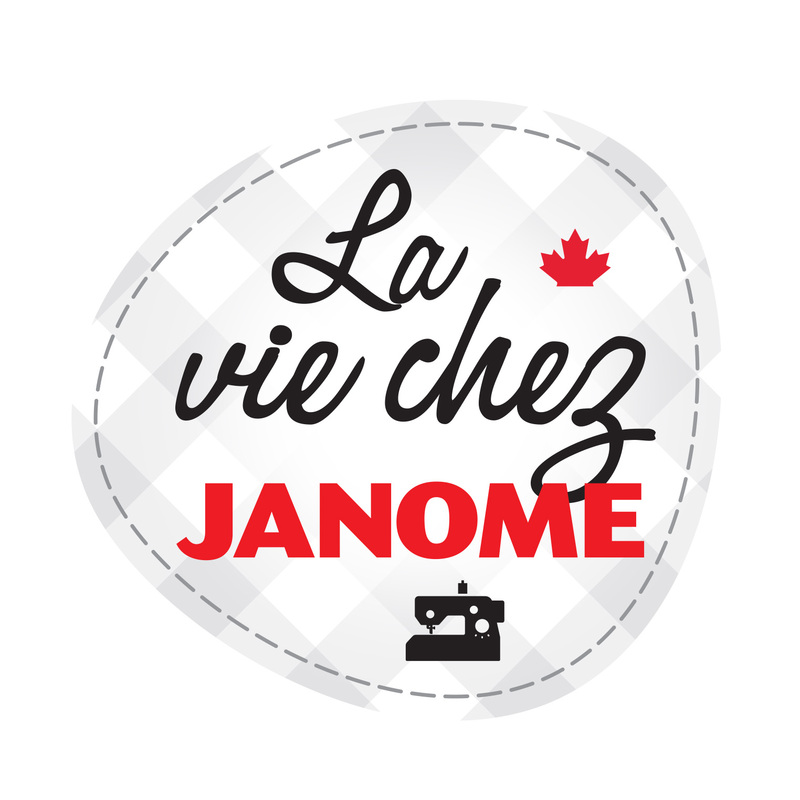 The new features of the MC 9450 QCP were highlighted last week as our Janome Machine of the Month; a new series which debuted here on Janome Life. Be sure to click the “Follow” button so you don’t miss a post! One of MY favourite exciting new features is the debut of a BRAND NEW presser foot, the fabulous AcuFeed Flex Professional Grade HP2 foot. Click on the highlighted link for more information. The foot holder is marked HP2 on the side, so don’t worry, you won’t accidently mix it up with the Narrow/ Single AcuFeed Flex foot holder. Janome is known for their wide array of specialty presser feet, which make whatever sewing or quilting task you have, quicker and easier with more professional results. The same is true of the new AcuFeed Flex Professional Grade HP2 foot. Not only does its narrow profile provide a perfect, accurate 1/4 inch, the foot has several very useful quarter inch marks on it to help align your fabric, specifically when pivoting or sewing those once-dreaded “Y” seams. Yes, I said it! “Y” seams, also known as “Inset” seams. They strike fear in a whole generation of quilters, but they are a piece of cake when using this foot, and, since this foot has the magic of Janome’s AcuFeed Flex feeding system, you can achieve accurate, even piecing results each and every time. As mentioned previously, the new Acufeed Flex Professional Grade HP2 Foot comes with the new Horizon Memory Craft 9450 QCP, but, never fear, it’s also available in a Blister Pack to use with the Janome MC 9400 QCP, the MC 6700P, MC 15000 updated to version3/Quilt Maker, and MC 15000 Quiltmaker. 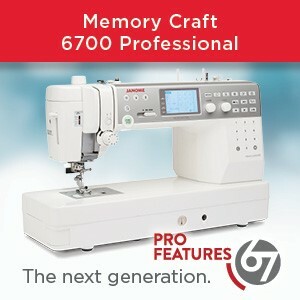 Please visit your local Janome Dealer for more information. This entry was posted in Janome Foot of the month series and tagged ACUFEED FLEX WITH JANOME, Horizon MC 9400 QCP, Horizon MC 9450 QCP, Inset Seams, Janome AcuFeed Flex Professional Grade HP2 Foot, Janome HP needle plate and foot set, Janome Sewing Machine, Sewing Y Seams. Bookmark the permalink. Will this foot and the 1/4” foot be suitable for the horizon 7700? No, Lane. As explained in a couple of posts: this is ONLY compatible with machines which have the HP foot and plate and their software is therefore configured for extreme left needle position and a special plate for this. The machines are: MC15000; Mc6700P, MC9400 and MC9450. It’s hard to tell from the pictures, but does this new foot have the same center mechanism as the Narrow/Single Acufeed Flex foot? I have the HP Professional foot/plate, and I think it’s the best combo Janome has come out with yet – perfect 1/4″ seams! That’s why I’m wondering about the center of the new foot. Thanks! No, it is not exactly the same – is a little narrower due to the very narrow HP foot size at the front. The upper feed dog is behind this. I would have no hesitation in recommending it for 1/4 inch seams and a whole lot more. I do use a small leader if I am wanting to start stitching right at the edge of the fabric – eg as in 1/4 inch piecing. Hello, I have a Janome 2030QDC which came with a walking foot; I use it a lot however, I find it difficult to attach it to my machine. Is there an alternative walking foot that is easier to attach to this machine? No, there is only the one type – that came with your machine. Please ask your local Janome Dealer to show you how best to attach the walking foot as it should not be difficult to do. Perhaps you just need a few tips to assist you? Will this new foot fit the 8900? Please see my other replies below on this topic – especially the one re MC8900. The same applies as in those replies. Is this foot compatible with the 12,000? No, sorry, Doreen. It is only compatible with machines which have the HP foot and plate: Mc15000, MC9400/9450 and MC6700P. No, sorry, the machine has to be compatible with the HP foot and plate – Janome MC15000, Mc9400/mc9450 and MC6700P at his stage only. Thank you for your query. I googled “piecing in the hoop” and found quite a few You Tube video’s as well as a number of websites you could take a look at. All would require a certain amount of digitizing if you wished to create your own designs. There are also pre-digitized designs available. Cindy Losekamp springs to mind. She had ( hopefully still does have ) a whole series of lovely piecing in the hoop blocks. 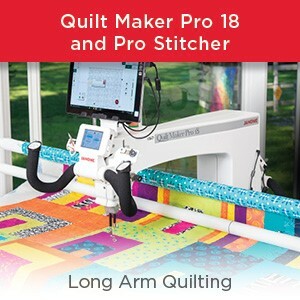 Of course you can use the normal sew section in your fonts on the MC11000 to create your own straight lines of stitching for placement lines as well as stitching lines and then hoop and piece with a flip and sew method. I know I did this on the MC11000 so am 100% suRE it can be done. Somewhat slow to build the design on your edit screen line by line which you would rotate and move to build your design but entirely do-able. I made several blocks this way some years ago. Much easier to do in Digitizing software but I wanted to suggest options. Sorry, no, I am unaware of any plans to retroactively add the HP foot and plate to the MC12000.